Proof is in the Progeny! TAG Peruvian Nitro dark rose grey male with the total package! He has the macho presence, but still maintains a very gentle temperament. 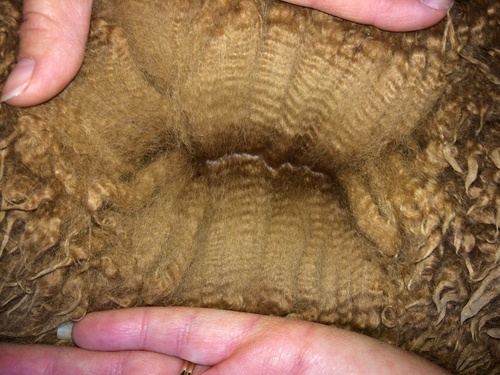 Nitro has incredibly dense fiber, fantastic consistency and fineness. It's no wonder that Nitro is out of some of the countries top bloodlines. has outstanding density and extreme character development with high frequency, high amplitude crimp that bundles and he passes along these qualities to his offspring. In addition, Titan is an Accoyo male who excels whether he is bred to white and produces white offspring or, when bred to colored females, produces colored offspring. Nito's Dam is Peruvian Nealie, a black daughter of Majestic Peruvian Jeremiah, the 13 time champion and multiple time Herdsire of the Year in both dark and light. 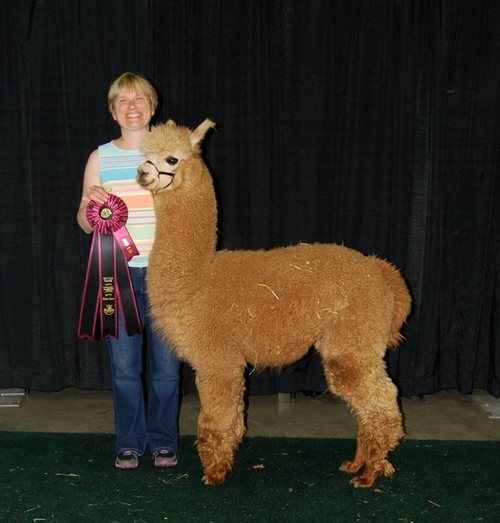 Nitro's pedigree also includes Peruvian Jericho, Peruvian Dakotia, Peruvian Bueno, Peruvian Don Julio, Peruvian Donovan, 5Peruvian Inca's Ransom and PPPeruvian Augusto. We are only doing 10 outside breedings in 2012. Nice square 1/2 Accoyo girl with Hemingway, Accoyo Victor, Accoyo McGwire and Mister Miracle Whip on her pedigree. This girl has the density of her father and the legendary fineness put down by Hemingway. Rose is one of our Foundation girls. 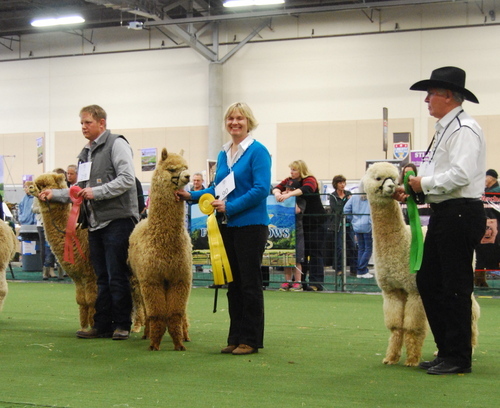 Rose has delivered us three absolutely beautiful male Cria, Cedar's Maverik, Cedar's Kaboom, and Cedar's Magnum (sold). Kaboom! This handsome male lives up to his name for sure! He is exploding with fleece! Kaboom a beautiful dark fawn male has incredibly long staple length even at 3 years of age. 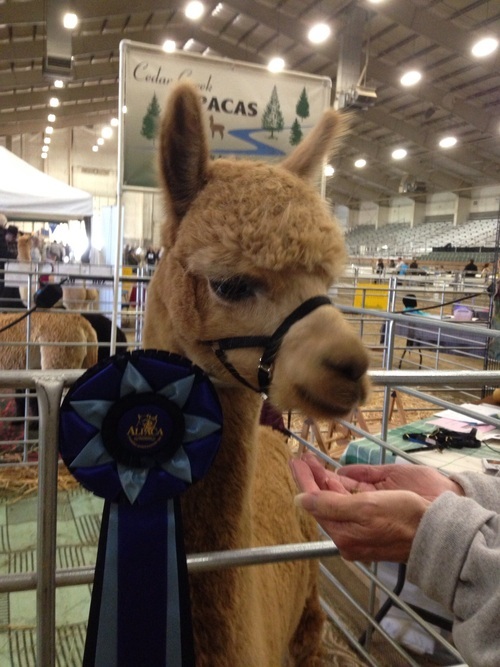 He has impressed judges with his staple length good hand, fineness and great organization across his blanket. Kaboom has consistently place high in his class with one first and three seconds in the last two years. Kabooms sire is TAG Peruvian Nitro and his dam is McGwires Evening Rose. Kaboom has his first Cria on the ground! A beautiful female owned by one of our clients. We are expecting more cria on the ground in 2018. We do offer creative financing options. Please give us a call and let us help you finance your purchase! 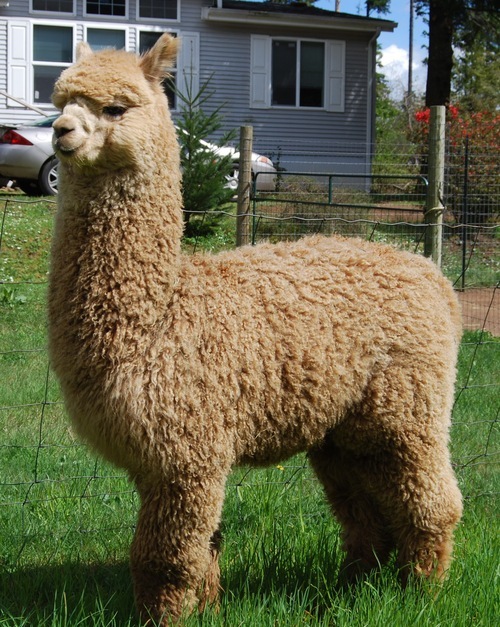 Is it our policy to not sell one lone alpaca unless he or she is going to an established farm with other alpacas. 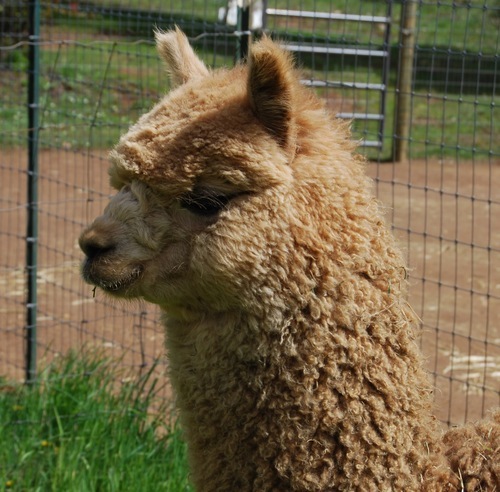 Alpacas are a herd animal and they like to be around other alpacas. Ask us about a package deal of two or more!